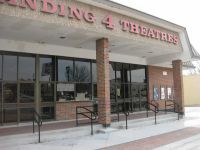 formerly the Landing 4 Theatres. It became the B & B Leavenworth Landing 5 (B & B Theatres) in December 2017. This movie theater is near Leavenworth, Ft Leavnwrth, Fort Leavenworth, Lansing, Farley (MO), Platte City (MO), Ferrelview (MO), Kansas City (MO), Waldron (MO), Weston (MO).